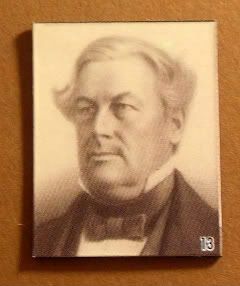 I've been thinking a lot about travel lately, and this guy, Millard Fillmore, our 13th president best represents that thinking. He's the guy that started it all, really. One weekend roadtrip, we went to Niagara Falls and on the way back we saw a sign for Millard Fillmore's house. I yelped, Millard Fillmore's house! We have to go! And my road trip buddies were like, Who??? So yeah. We stopped, so we could take pictures of the building...and thus begun a long history of roadtrips and roadside attractions. Of course, my penchant for roadtrips was ingrained by the time we saw Millard's house, with immigrant parents who loved exploring what this country has to offer. But the need to start itinerary-planning blossomed shortly thereafter. I do so love traveling. I hate the spending money. I hate the packing, but I adore the planning (once I finally settle into it) and of course, the actual travel. So the concept of not wanting to travel to places is totally foreign to me. How can you not want to see what's in other countries? Their history, their culture, their people? On the other hand, sometimes it's easier and safer and certainly cheaper to stay home. Which I totally understand. Totally. Except when I've got wanderlust. And boy, have I got it bad. People continue to be impressed that I know who our 13th president was.